Flooding across the Midwest is at a level not seen since the deadly 2011 Mississippi River floods. 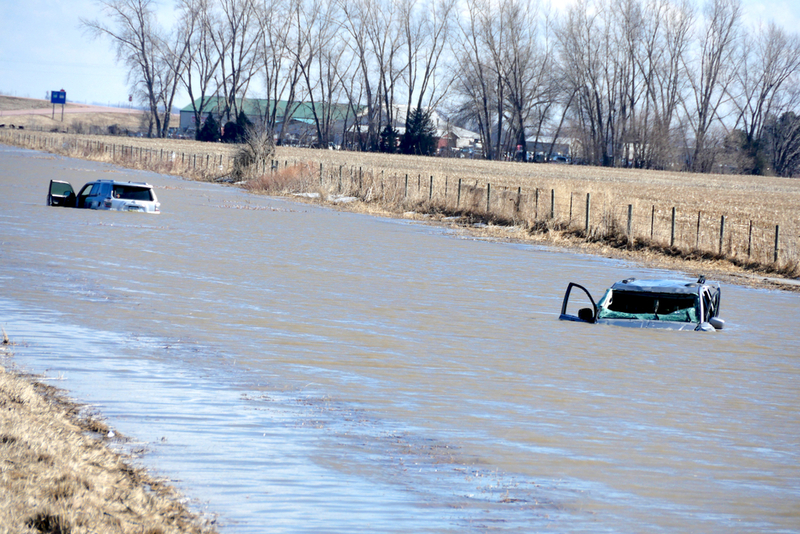 Floods in South Dakota submerge cars. A so-called “bomb cyclone,” which refers to a high level of change in barometric pressure, smashed through the Midwest last week. In Iowa, Nebraska, South Dakota, and elsewhere, the level of destruction to America’s farmland has rarely been seen before. The storms unleashed high levels of rain and snow, along with tornadoes, powerful winds, and forced both the Mississippi and Missouri Rivers to overflow, flooding the flat, valuable farmland nearby. The lakes that formed as a result of the flooding are just now, about a week later, beginning to recede, and farmers and agricultural workers are getting their first look at the situation on the ground. It’s…not good. Quick-rising floods destroyed stored grain in silos, trapped and then drowned livestock in barns and other facilities, and desperately damaged farmland. According to USDA regulations, grain that’s inundated by floods is considered tainted and must be destroyed. Worse, it also knocked out much of the infrastructure needed for repairs, including roads, bridges, communication systems, and water service. There’s no good time for a disaster like this to happen, but this is a particularly bad one; CNN reports that many farmers expect that their farms will not be ready to plant at the normal time this year. It’s extremely possible that many farms will simply not be able to recover; the combination of lost livestock, lost harvested crops, and damaged farmland may be too great for farmers to continue. Crop insurance should be a help, but it can’t make farmers entirely whole. It may come with hefty deductibles that farmers will have to pay out of pocket, may require separate insurance to cover stored grain, and in the end may only cover a percentage of the damages, to say nothing of how long it might take for payments to come. Initial estimates placed the damage to crops at around $400 million and to livestock at another $400 million in Nebraska alone; those estimates are likely to be on the low side. At least four people have died, reports Reuters.